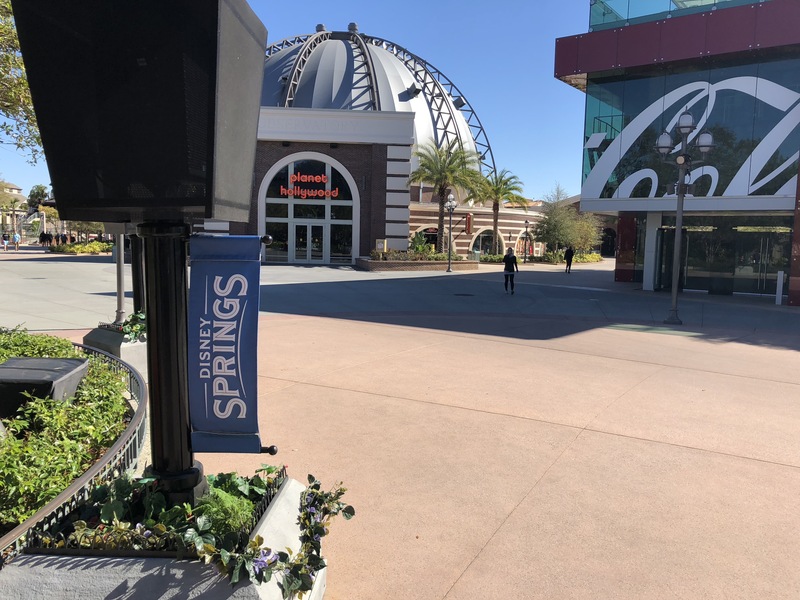 Did I just post about a new machine at Disney Springs. Well with all the changes that have gone on there plus the still to come new restaurants and stores I find myself spending more and more time there and enjoying every moment. 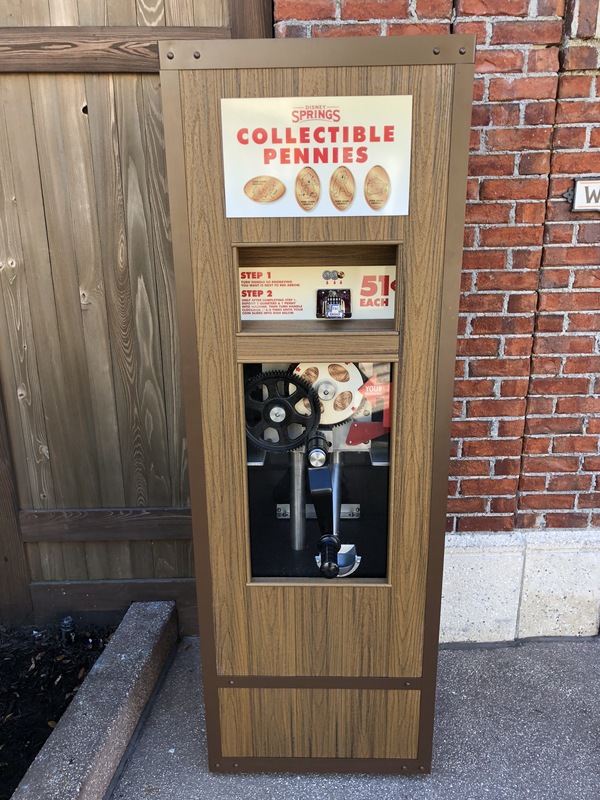 I don’t find myself needing an excuse anymore to go visit the Springs but this past weekend when I heard that another new penny machine showed up I jumped in my car and headed over to check it out. For anyone thinking about visiting just for this machine as I did, I parked in the Orange lot which brings you down just near the big Coca-Cola store and Planet Hollywood restaurant. If you walk between these two buildings directly in front of you is a covered area that starts the Town Center. 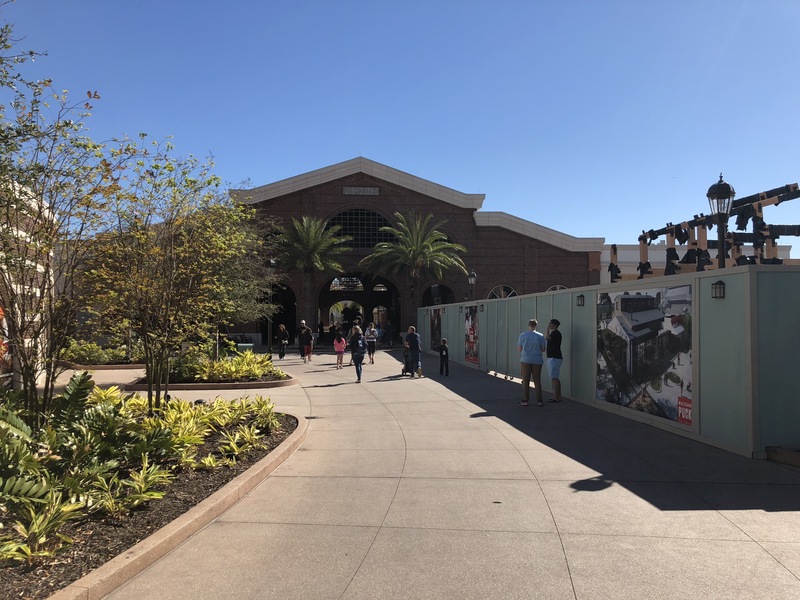 Behind the construction walls on the right side of the walkway in the picture above is the Wolfgang Puck restaurant coming soon. 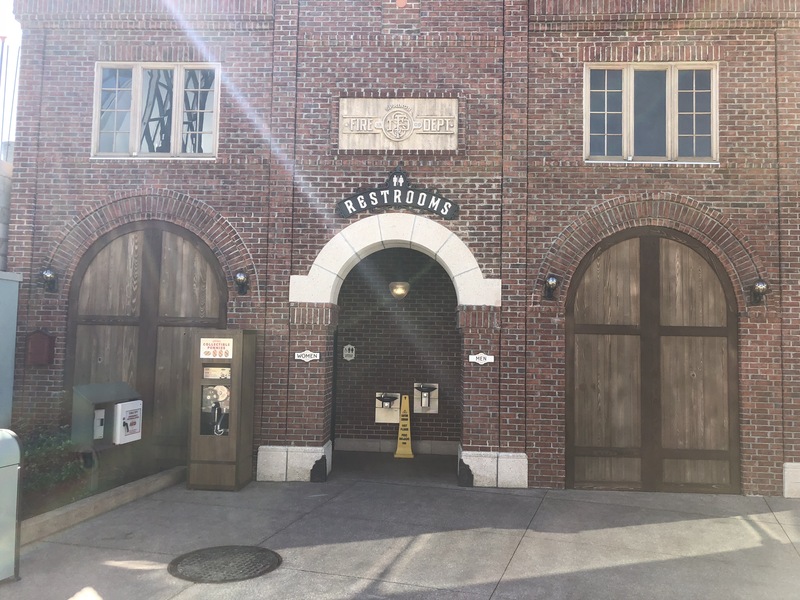 But right before that on the right side is the Firehouse also known as the building where the restrooms are located. This does make for some awkward moments trying to take pictures and video but thankfully I visited early in the more before this area got too busy. This is a 4-design hang crank machine in a nice full wood cabinet. 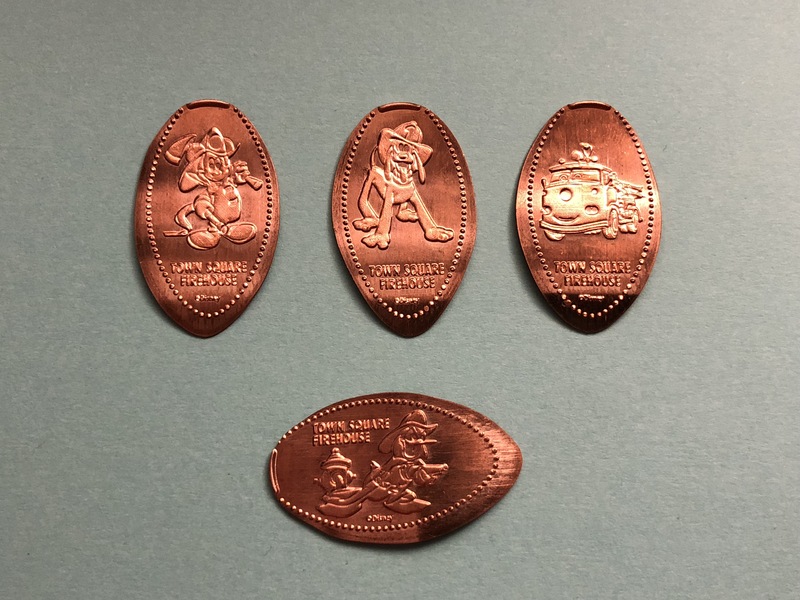 The designs that press on the pennies include Firefighter Mickey, Firefighter Donald, Pluto with a fireman’s helmet, and Red the fire truck from the Pixar movie Cars. As you can see from the picture above the images came out nicely, however this actually took me quite a few tries to get this set to roll properly. 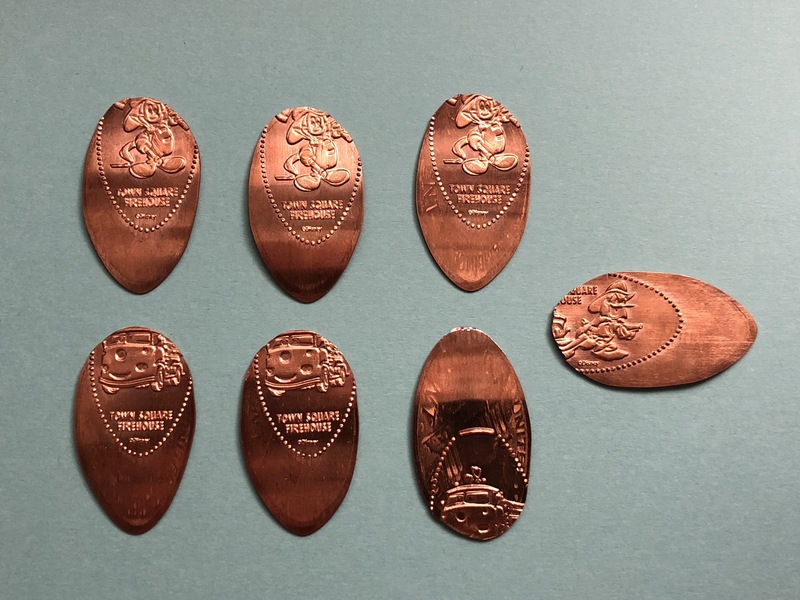 Above is a picture of the seven other pennies I tried to press that didn’t roll correctly. Considering this is a brand new machine it’s surprising that the machine wasn’t aligned properly. Just as a tip for anyone that may be using this machine I tried turning the handle fairly slowly and starting to press the design a little earlier that having the arrows completely lined up as per usual process. It took a little practice but was able to get a full set eventually. The machines throughout Disney property usually have stickers on them where you can report a message that is broken. Unfortunately this machine didn’t have that so I tried submitting a note through one of the other machines to see what happens. It’s not completely a lost cause at this point, but can be frustrating so make sure you bring some extra coins. Always pays to be a little over prepared.